Sigma Beauty Affiliate Program: NEW Product! Sigma Beauty Spa Solutions! 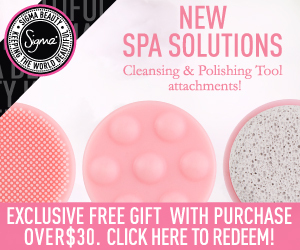 The Sigma Beauty Spa Solutions Kit contains three unique attachments for the Cleansing and Polishing Tool. The attachments were specifically designed to create the ultimate spa experience! · The extra-soft brush is a silicone attachment that is perfect for gentle cleansing for extra-sensitive skin. · The unique silicone massager attachment maximizes absorption of skin care products and stimulates skin circulation. · The exfoliator attachment is a pumice stone, best for removing dead skin cells to reveal healthy looking skin. NOTE: This attachment is not intended for the face. We created new affiliate banners to celebrate the release of the Spa Solutions Kit! To use one of the banners, save the image to your computer, upload it as an image to your blog, and add your affiliate link as the URL. Sharing new product information the FIRST week of the release is the best strategy to increase your affiliate sales. Update your blog with a new banner and share the ultimate spa experience with your followers! For more information about the Spa Solutions Kit, click here! Excelente!!! ya actualice el mio! Saludos!! visit my webpage www.globemakeup.com n buy some gifts for ya n those ones u do love!!!! Queria banners em português, tem? We do not have the Spa Solutions banners in Portuguese at this time, however you can contact affiliate@sigmabeauty.com for others banners in Portuguese. Hoew I can use this new banner? @Federica To use one of the banners, save the image to your computer, upload it to your blog as a picture and insert your affiliate link as the URL. Please contact affiliate@sigmabeauty.com if you have any additional questions. I love to you use sigma. this post is great in all.